April 26, 2018 April 27, 2018 jhgraham	Film Noir	Tags: Beverly Hills, Film Noir, The Brown Derby, W. & J. Sloane, Wilshire Blvd. 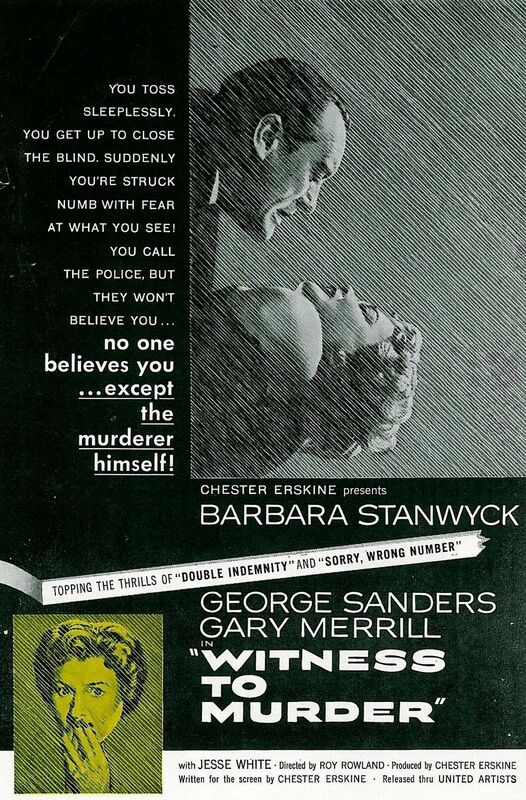 Based on an original screenplay by Chester Erskine and Nunnally Johnson (uncredited), Witness to Murder is a crime thriller directed by Roy Rowland starring Barbara Stanwyck, George Sanders and Gary Merrill. 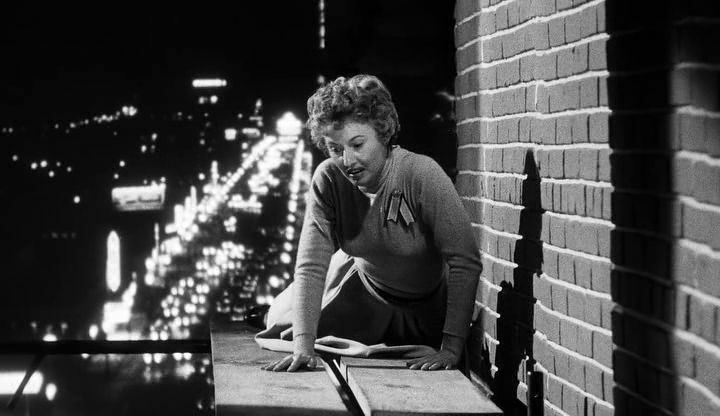 Barbara plays Miss Cheryl Draper, an interior designer with Sloane’s in Beverly Hills, who wakes in the middle of the night and sees a woman being choked to death by a man, Albert Richter, (Saunders) in the apartment across the street. The police duly investigate but find no evidence of a crime, and suggest to a dubious Cheryl that she must have dreamt the episode. The next morning, she sees Richter loading a trunk into the back of his station wagon. 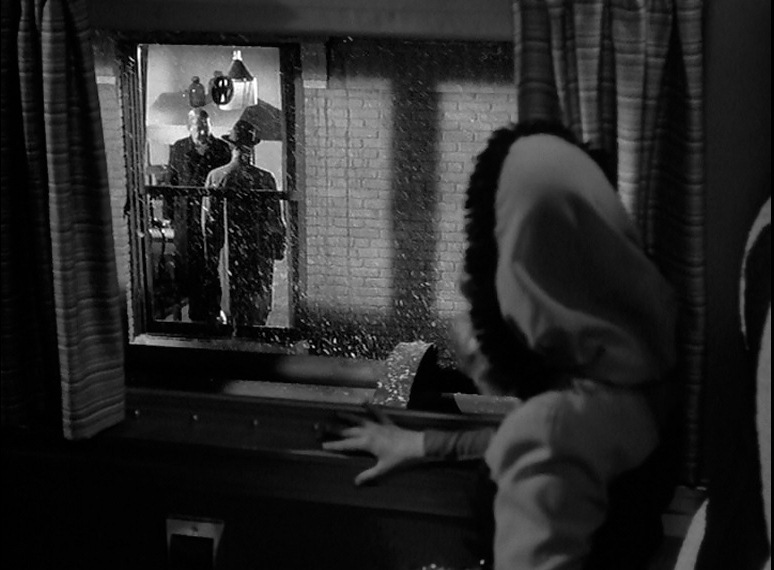 Sympathetic detective Larry Matthews (Gary Merrill) looks into Richter, who meanwhile convinces Matthews’ boss Captain Donnelly (Harry Shannon) that Cheryl is mentally ill, and Donnelly has her tossed in the psychopathic ward of the city hospital for observation. This plot line was not in the least bit far-fetched. It remained remarkably easy even in 1954 Los Angeles for authorities, a spouse, other relative or friend, to have someone committed for psychiatric observation. Such cases were taken to the psychopathic ward of the County General Hospital, where the person would be examined by a doctor, and could either be released on the doctor’s recommendation or remain in custody indefinitely until/unless he or she demanded a trial (1). Witness to Murder debuted in Los Angeles theaters on May 12, 1954, three months before the now more well-known, bigger budgeted Rear Window, which features a similar plot premise. 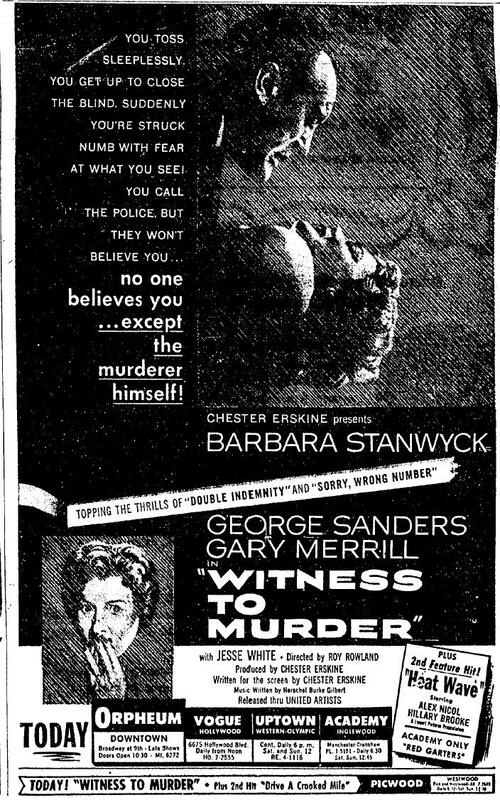 Witness to Murder ad 5/12/1954, showing with the British crime drama Heat Wave (known in the UK as The House Across the Lake), and at the Picwood, Drive A Crooked Mile. 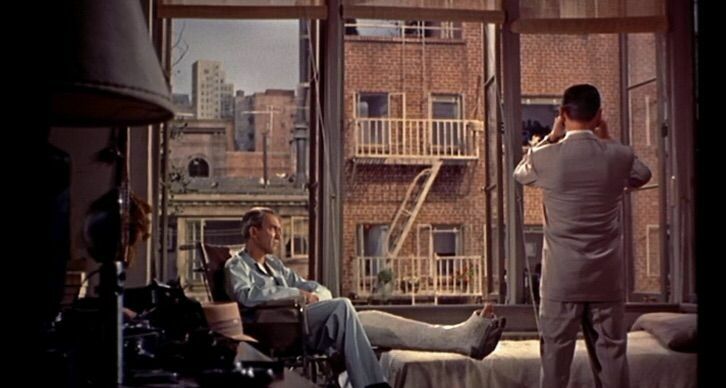 Rear Window, filmed in Technicolor and directed by Alfred Hitchcock, was based on a 1942 Cornell Woolrich (aka William Irish) short story “It Had to Be Murder,” which itself was based on an 1894 H.G. 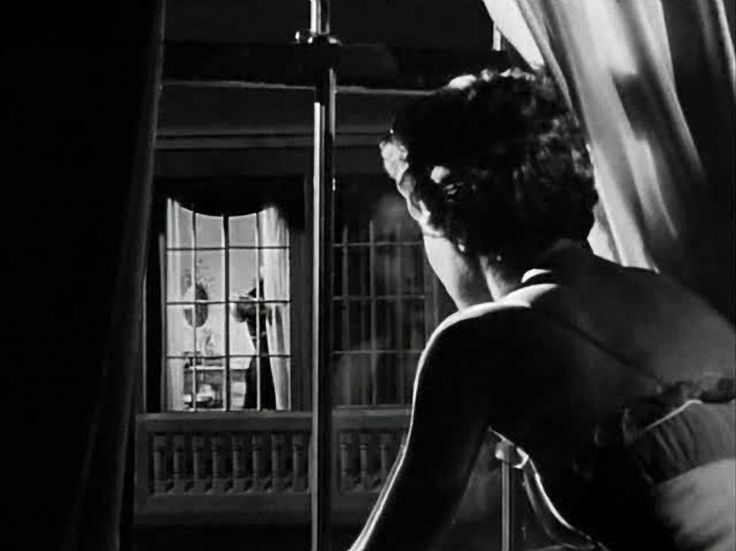 Wells’ short story, “Through a Window.” Jimmy Stewart’s L. B. “Jeff” Jeffries doesn’t even witness an actual murder, just some strange behavior by his neighbor across the way and the sudden absence of the man’s invalid wife. His detective pal is skeptical of Jeff’s story, but at least doesn’t suggest he’s a candidate for the booby hatch. The premise had also been played for laughs in Lady on a Train (1945), based on a story by Leslie Charteris (writer of the detective Simon Templar novels, alias “The Saint,” which were made into a series of films by RKO 1939-1941 starring George Sanders). The lady of the title (Deanna Durbin) is a rich society girl in the madcap heiress mold who glimpses a murder being committed through the window of a nearby building as her train is passing by. She reports her observation to the police, who patronize her and send her on her merry way. Durbin proceeds to try to solve the crime herself with the help of a popular mystery novelist (Charteris spoofing himself perhaps). 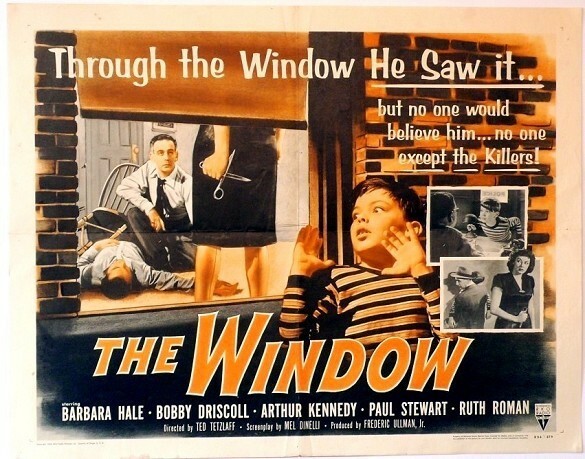 More recently, the plotline of a witness to murder had been seen in the 1949 thriller The Window, directed by Charles David and starring Bobby Driscoll, Barbara Hale, and Arthur Kennedy. Based on another Cornell Woolrich story, “The Boy Cried Murder,” in this version it’s a small boy who sees a murderer in action and is not believed, neither by his parents nor the police, due to his propensity for telling tall tales. As in Cheryl Draper’s experience, the adults try to convince the lad it was just a bad dream. 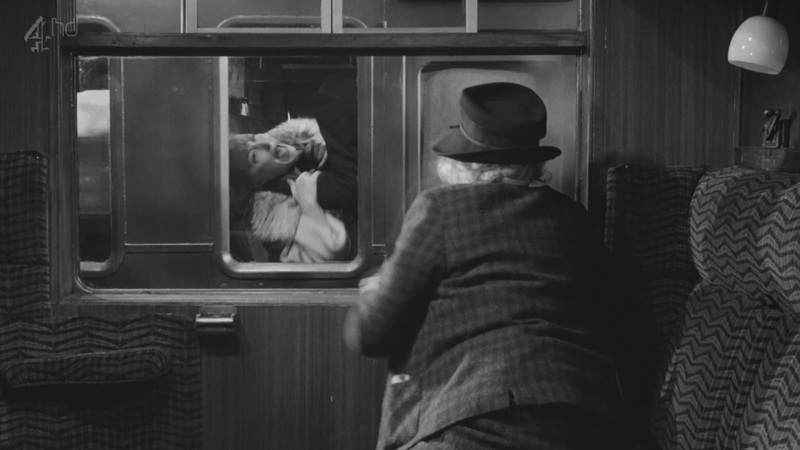 In 1957, mystery writer Agatha Christie would also use the premise for a Miss Marple novel, 4.50 from Paddington (published in the United States as What Mrs. McGillicuddy Saw), in which an elderly lady on a train sees a woman being choked to death on a train headed in the opposite direction, murderers still not having learned not to commit their crimes in front of a window. Her story is summarily dismissed by Scotland Yard. The book was adapted as a movie, Murder, She Said, in 1961. 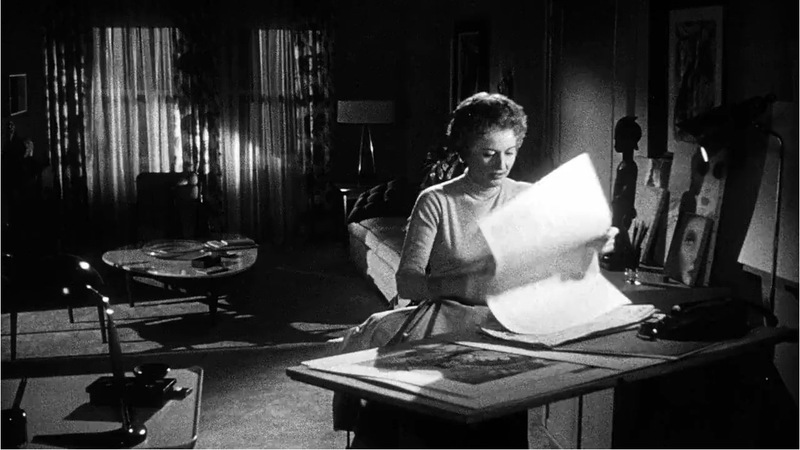 In Witness to Murder, Richter’s attempts to establish that Cheryl Draper is the one who’s crazy and his attempts to convince her she may as well end it recall shades of Mrs. Danvers and the Second Mrs. De Winter in Rebecca (1940, Hitchcock’s U.S. directorial review, based on the Daphne du Maurier best seller), as well as murderous husband Gregory who has his wife Paula questioning her sanity in Gaslight (1944). 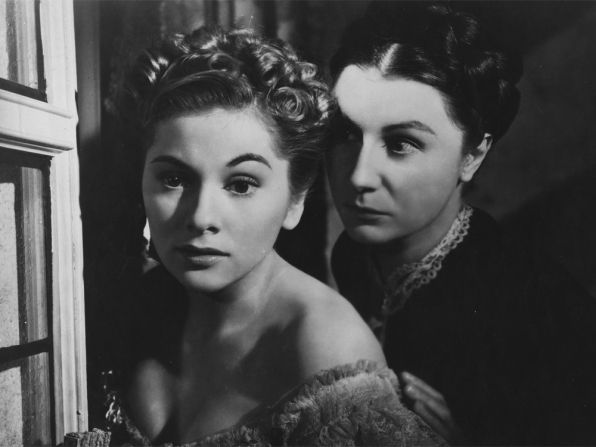 Judith Anderson and Joan Fontaine in Rebecca (1940). 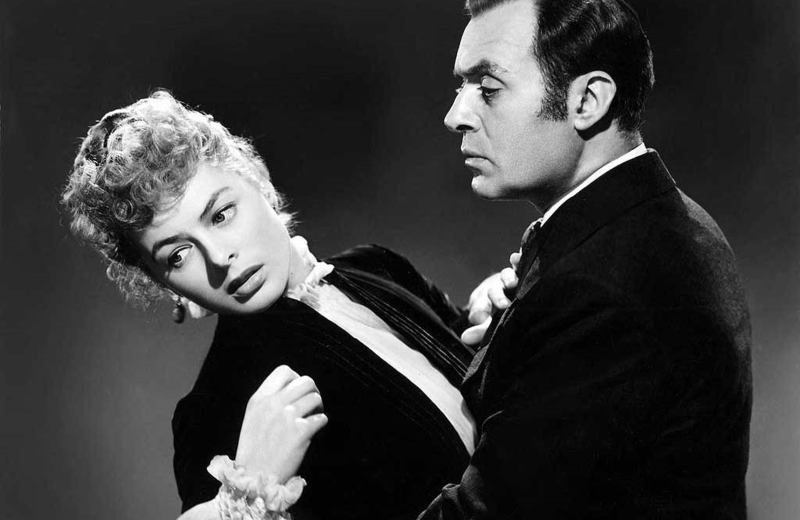 Ingrid Bergman and Charles Boyer in Gaslight (1944). 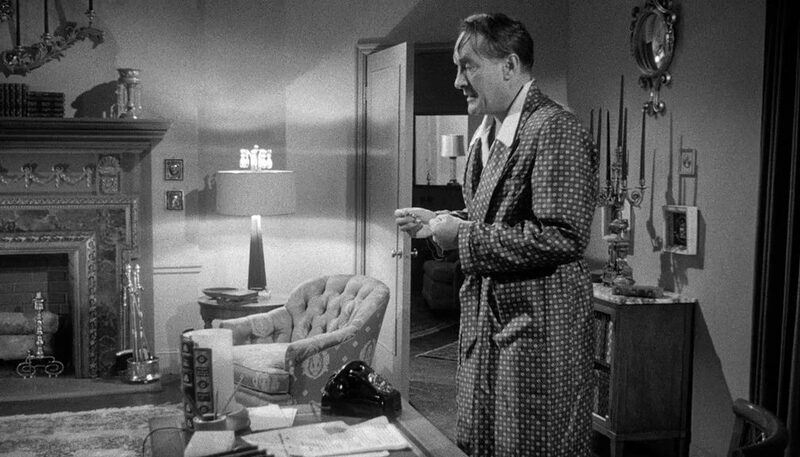 Longtime LA Times reviewer Edwin Schallert praised Witness to Murder for its strong performances, but acknowledged that it was not particularly novel. Unlike any of the others mentioned, however, the film is set in Los Angeles, with many of the exterior scenes shot on location. 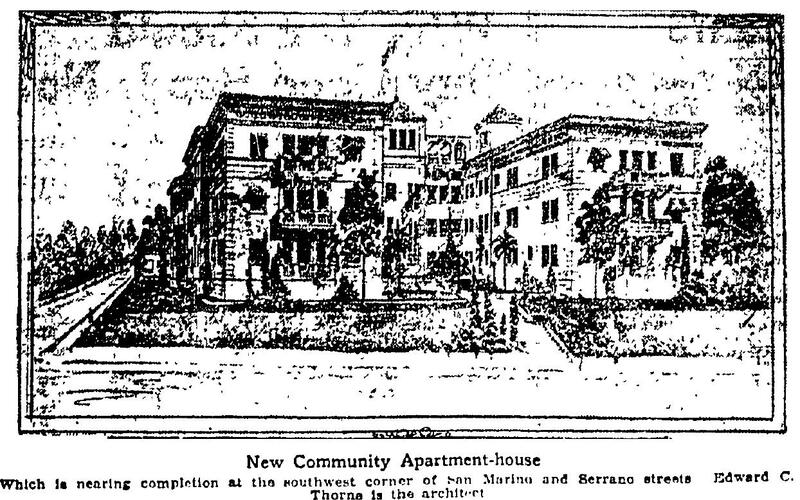 Cheryl Draper’s and Albert Richter’s apartments actually existed (and still exist) at the intersection of Serrano Avenue and San Marino Street near Wilshire Boulevard. San Marino and Serrano at night from Witness to Murder, photographed by John Alton. 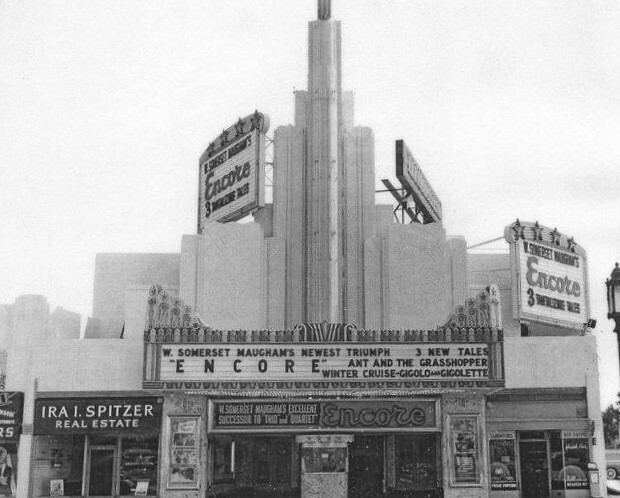 Mira Monte Terrace, opened in 1922 at 3400 San Marino St. at the southwest corner of San Marino and Serrano. LA Times 6/25/1922. 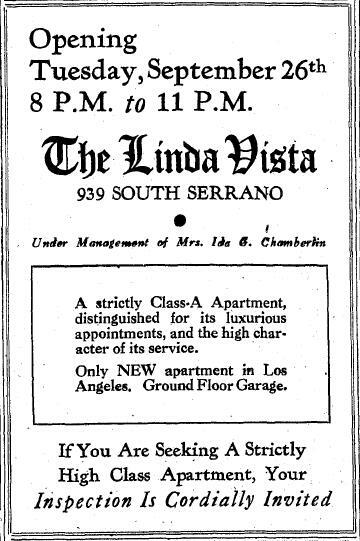 The Linda Vista, at 939 S. Serrano Ave. at the northwest corner of Serrano and San Marino, started construction in 1930 but due to the economic crisis of the Depression, sat unfinished for two years before it was finally completed by new owners in 1933. LA Times 9/24/1933. Stanwyck’s Cheryl Draper is an interior designer for W. & J. Sloane’s, which was a real furniture, home décor and interior design services firm with outlets in major cities across the US. The exterior shown in the film was their actual Southern California headquarters, located at 9560 Wilshire Boulevard in Beverly Hills. 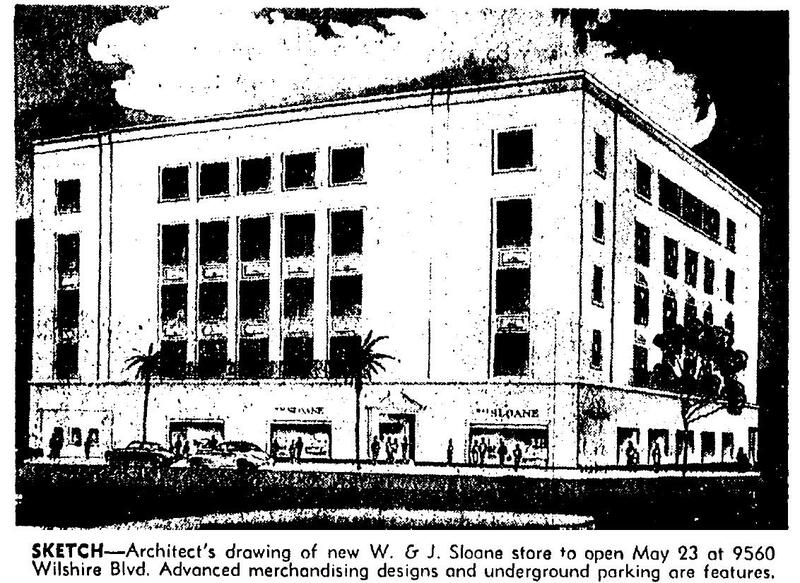 Sloane’s moved to this building, which was designed by architect Paul Williams, on May 23, 1950, from its previous location a block away at 9536, where the firm had been located since 1935. The new W. & J. Sloane Building designed by Paul Williams. Huntington Library. W & J Sloane’s even gets a screen credit for providing the furniture and décor for Chery Draper’s modern apartment in the film, and Albert Richter’s antique-filled apartment (Sloane’s specialized in period reproductions). Cheryl Draper’s modern, artistic living room/studio. Albert Richter’s living room aka the scene of the crime. 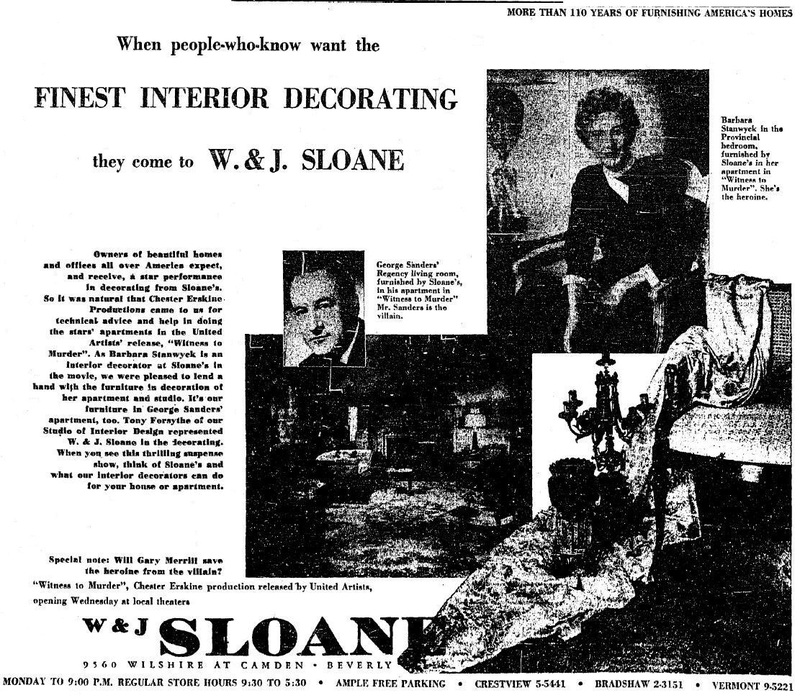 W.& J. Sloane ad in the Times, 5/10/1954 capitalizing on its role in Witness to Murder. It helpfully points out that Barbara is the heroine and George is the villian. 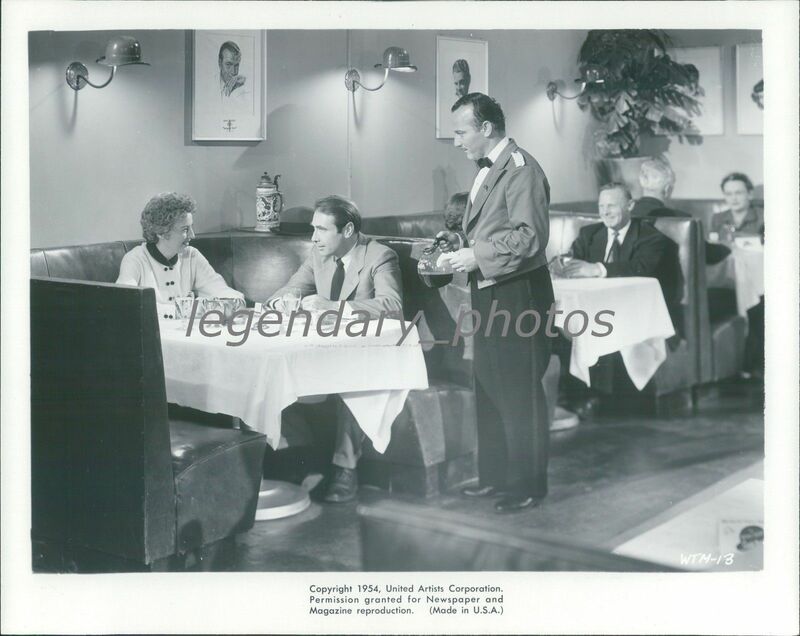 Though the exterior is not seen in the film, the restaurant where Cheryl and Detective Matthews dine was clearly intended to be The Brown Derby. 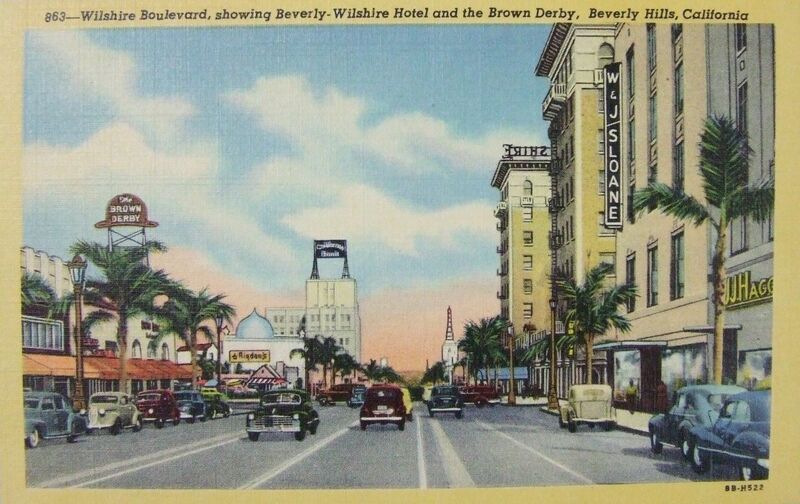 Likely recreated on a studio set, it appears to be a fairly authentic recreation of the Beverly Hills Brown Derby at 9537 Wilshire Boulevard at Rodeo Drive, only a block away from Sloane’s (this was not the original hat-shaped Derby, which was further down Wilshire at 3377). 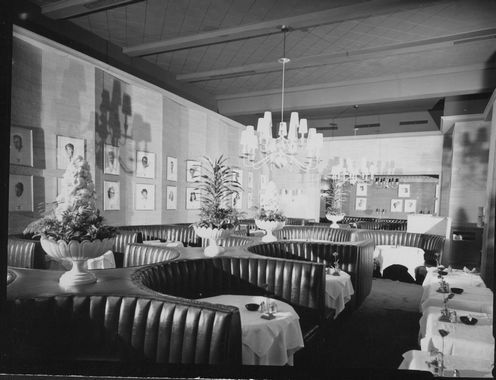 The Academy Room dining room of the Beverly Hills Brown Derby in 1964. It featured charcoal portraits of Best Actor and Best Actress Academy Award winners by artist Volpe. 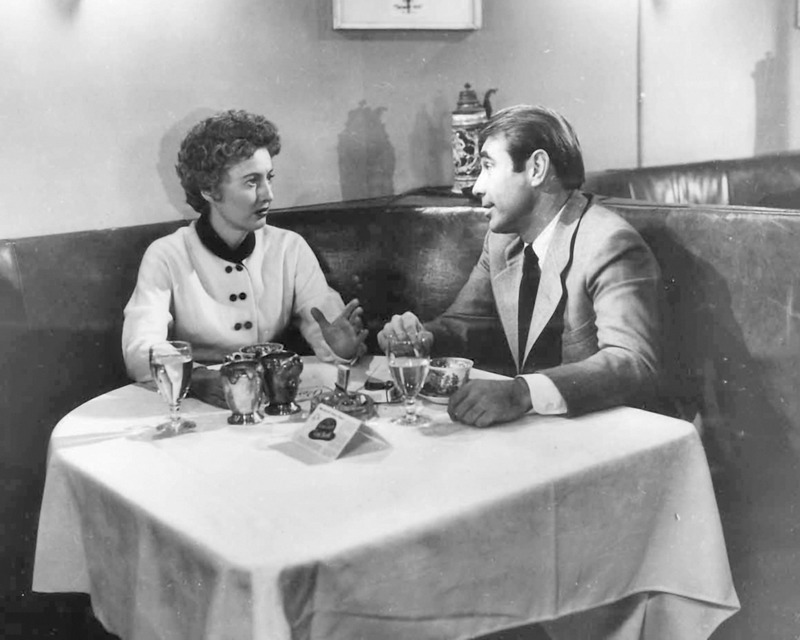 Production still from Witness to Murder. eBay. Detail of the Beverly Hills Brown Derby set as seen in Witness to Murder. Note the folded Brown Derby advert card on the table and the matches in the ashtray. 1948 postcard view of the 9500 block of Wilshire Boulevard showing the Beverly Hills Brown Derby (9537) at left and the previous location of W. & J. Sloane, at 9536, before the firm moved to 9560 in 1950. Neighboring clothier J. J. Haggarty expanded into this space in January 1956. 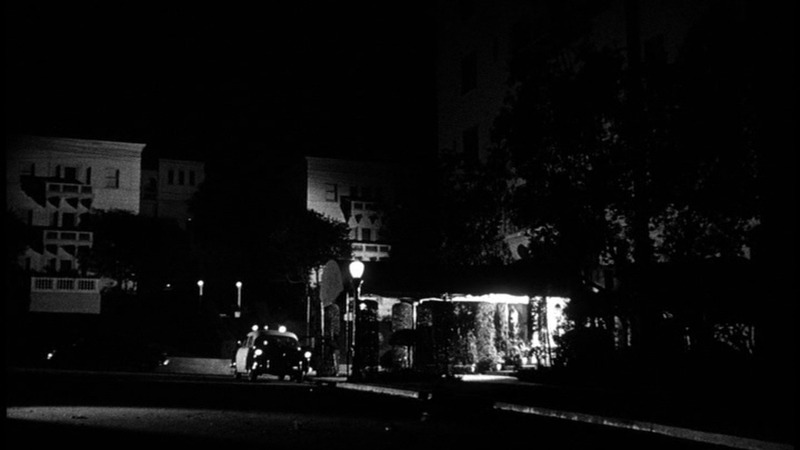 In a later nighttime scene, a distressed Draper drives along the 5100 block of Wilshire Boulevard, passing recognizable landmarks such as the 4 Star Theater at 5112 (built in 1931). 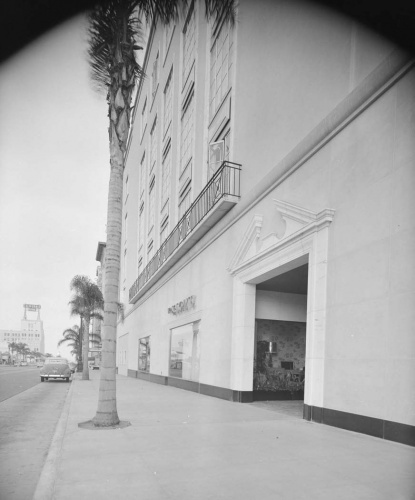 Daytime view of the 4 Star Theater at 5112 Wilshire Boulevard in 1952. LAPL. During the film’s climax, this stretch of Wilshire can again be seen at night, most notably the neon beacon atop the General Insurance Building at 5225 (built in 1929 as the Clem E. Wilson Building). 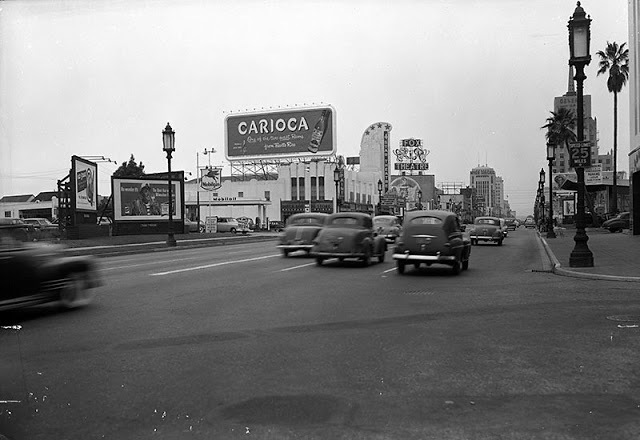 Daytime view of Wilshire c. 1950 showing the 4 Star Theater on the left at 5112 and the General of America Insurance Building on the right at 5225. Also seen is the neon roof sign of the Fox-run Ritz Theater at 5212. (1) One of the most notorious of such cases occurred in 1928 when an LAPD detective had Mrs. Christine Collins committed to the county psych ward when she insisted that the boy the LAPD had identified as her missing 9-year-old son Walter was, in fact, not Walter at all. Walter went missing on March 10, 1928. Mrs. Collins reported it to the police a few days later, fearing he may have been kidnapped by enemies of her husband Walter Sr., then doing time in Folsom Prison for robbery. The police took the boy’s disappearance seriously, initiating a statewide, and later a nationwide, search, and dragging the lake at Lincoln Park to no avail. Walter’s trail seemed to go cold. Then, in August, a boy in De Kalb, Illinois, came forward and identified himself as Walter Collins. Mrs. Collins tentatively identified him from blurry photographs. LAPD detectives were initially skeptical of his story but he was eventually brought West at Mrs. Collins’ expense. On seeing him in person, Mrs. Collins realized he was not her boy, after all. The LAPD’s Capt. Jones insisted that the boy was Walter and told Collins to go on and take him home, try him out for a while. An intimidated Collins did so, but after three weeks brought the boy back to police, insisting he was not her child. Jones berated Collins: “What are you trying to do, make a lot of fools of us all? Are you trying to shirk your duties as a mother and have the State provide for your boy?” On September 8, he had her committed to the psychopathic ward of the County General Hospital, where she remained until September 13 when doctors pronounced her sane. Finally, on September 20, the boy admitted he was really Arthur Hutchins Jr. of Cedar Rapids, Iowa. The following day, a grand jury in Riverside County indicted Stewart Gordon Norcott and his mother on suspicion of murder of four boys at their chicken ranch in what was then the community of Wineville. One of the boys believed murdered by the pair was Walter Collins. On September 24, 1928, Mrs. Collins demanded an investigation into her imprisonment at Jones’ behest. The Police Commission duly ordered a hearing on the matter but ultimately ruled Collins commitment as justified and refused to discipline Jones. LAPD detectives testified that Jones hadn’t used abusive language toward Mrs. Collins as she testified, and that she was delusional. The doctor testified that he’d examined Mrs. Collins and found her to be normal in every way and free of delusions. Rev. Gustav Briegleb spoke up for Collins, and from his popular pulpit questioned whether officers willing to perjure themselves should be allowed to testify in the Collins case. Collins in turn filed a lawsuit against Jones for false imprisonment. Christine Collins moved to the Bay Area to be closer to her husband (who became ill and died in prison) but would spend more than a decade pursuing her case and trying to collect her settlement, which she intended to use to continue the search for Walter. She was awarded $10,800 against Jones on September 18, 1930, renewed in February 1936 (with interest), but as of January 1941 she still had not been paid the money. The tragic circumstances of Walter’s disappearance and Mrs. Collins’ experience were portrayed, with some details fictionalized, in the 2008 film The Changeling. The LAPD, the D.A.’s office and the administration of Mayor Cryer were deeply immersed in a plethora of scandals at the time of her wrongful imprisonment lawsuit- including the Jacobson case, Albert Marco’s “excursions” from jail, and D.A. Asa Keyes’ indictment on bribery charges- with the end result that there were calls from the public for the removal of both police chief Davis and Capt. Jones. Both kept their jobs, but Davis was removed as chief and demoted at the end of 1929. Restored to power by a new mayor, Frank Shaw, in August 1933, he was forced to retire in November 1938 in the wake of the Harry Raymond bombing scandal, which also resulted in Shaw being recalled from office. In March 1939, Davis’ replacement under Mayor Fletcher Bowron “purged” the department of 23 high ranking officers, including Jones. While more high profile than most, Collins’ experience was not unique, nor was it an archaic practice of the 1920s. Thirty years later, Mrs. Doris Maben testified in Superior Court that her husband had had her committed to a mental institution on July 31, 1956 after she objected to his extramarital affairs. Dr. James Rankin, hired by her husband to examine her, came to the couple’s home and injected her with a hypodermic needle, then incarcerated her in the mental ward of a private hospital, where she was held captive for 15 days and given electro-shock therapy. Mrs. Maben sued the doctor for damages and won. Though acting here in his capacity as a private physician, Dr. Rankin had been hired by the LAPD in 1953 to give psychological exams to cadets. The State Supreme Court later reversed the judgement on a technicality. While condemning the doctor’s actions in that he did not have the required signed certificate to commit Mrs. Maben, the higher court found that the judge in Mrs. Maben’s case had made an error in his final instructions to the jury and that it was not the doctor’s responsibility to verify the husband’s statements about his wife’s mental state before committing her.